Greece is the country of azure seas, clear blue skies, golden beaches and white temples. That is why, since ancient times, tourists have travelled from one archaeological treasure to the other. Then there came the period of island hopping, visiting as many islands as possible with only a backpack, the more history an island had, the more visitors it had. Tourists booking flights and hotel together came next. Those tourists spent the majority of their holiday on the beach. Nowadays tourists seem to be tired of hanging out at the seashore all day; they are becoming more active and want to adventure out into nature. Lesvos has no world famous treasures, so tourism came pretty late and slowly. Maybe that is why the third biggest island of Greece has no big resorts and has not been exposed to the explosion of developers who, in just a few years, turned coasts and villages into the so-called ‘tourist paradises’. Lesvos is still mainly what it was: a paradise of nature. Of course all the sunbathers are more than welcome: the island has many beautiful and often deserted small beaches and a smaller number of larger beaches with tavernas like at Petra, Vatera, Skala Kalloni, Skala Eresos and Melinda. There is plenty beach pleasure to be found. Lesvos is the Greek island famous for birdwatching, wild flowers and for its Petrified Forest and it is only now getting discovered by a larger group of tourists for hiking. The island still has its ancient network of roads, consisting of narrow paths called monopati, once used by travellers on donkey, and the wider roads paved with boulders called kalderimia. Many have disappeared, sometimes crushed beneath a new tarmac road but some still slink through quiet meadows and whispering forests, passing small churches and old villages, right through the island’s breathtaking nature. Like elsewhere in Greece, on Lesvos the donkeys have been replaced by cars and many roads have been asphalted (or new roads have been built). This asphalt fever has slowed down so there are still some popular hiking roads – like the one going from Eftalou to Skala Sykaminia – left for the hikers and the one or two farmers and their pick-up trucks (and some tourists neglecting the orders of their car rental firms not too take the dirt roads). Tarmac roads connect most villages, although some of them have fallen into such a bad state they qualify as dirt roads again. Touring around the island provides great pleasure because the roads are quiet, the majority of other users tending to be flocks of sheep, wandering cows and donkeys. Car drivers who stop in the middle of the road in order to have a chat with a friend and birdwatchers with all their equipment form, along with the manholes, exciting distractions to keep you awake. 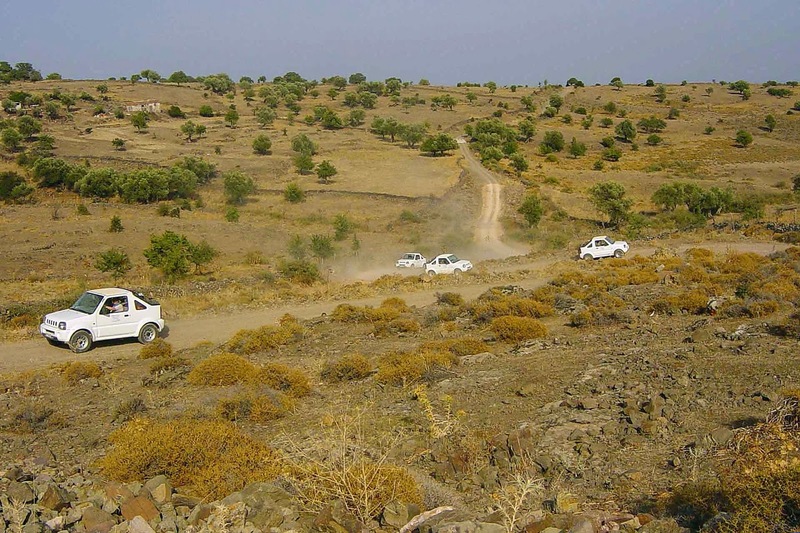 However not all the most beautiful areas are connected by tarmac and some can only to be visited by hikers or drivers with a 4Wdrive. If you really want to see the wilderness and are not a great walker, you had better rent a jeep or even better: book a jeep-safari. There is a risk of getting lost in the Lesvorian jungle, so a guide is no superfluous luxury. A guide will know which roads to take in order to see the most beautiful spots, to see wild horses, to help you climb to hidden little churches, to show you a waterfall or to present to you the fragile and sweet scent of the rare yellow Rodondendrons. You never know what you will encounter, but jeep-safaris are always full of surprises. High on the list of excursions offered by all tourist offices are the traditional boat trips, daytrips to the Petrified Forest and other bus excursions. But there is more to do on the island. The new tourist office Pandora Travel offers, along with a number of different jeep safaris, hiking, kayaking, sailing, diving, climbing a waterfall or an expedition to find orchids. For people already tired of reading about all those activities, Pandora also offers coaching with horses, donkey trekking, watching the stars and photography, mosaic or cookery lessons. It is clear that sunbathing for a whole day on the beach is ‘out’ and the new tourist trend is closer to nature: by foot or car hiking through nature, being creative with nature, outdoor sporting and learning what edible things nature offers. For parents who want their children to engage with nature they can book a family holiday at the micro farm and stay in a comfortable safari tent with a Greek farmer and his kids. For decades Lesvos has not been a hotspot for holidaymakers: it has no important archaeological monuments, it’s not on the most popular route for the masses of island hoppers, it has no big hotels at a beach. But now that the desire for nature holidays is growing, I am sure that this island - still not spoilt by tourism - will soon become the natural hotspot of Greece.